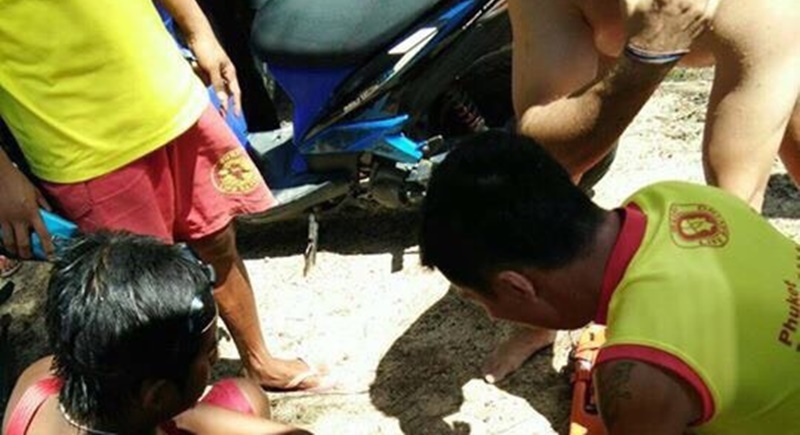 PHUKET: The chief of the Phuket Lifeguard Services has confirmed that a Chinese tourist who was pulled unconscious from the water at Karon Beach on Monday afternoon (Jan 9) died upon arrival at Patong Hospital. Lifeguards recovered 25-year-old Mr Xui Aushang from the water at Karon Beach at around 12:30pm on Monday, Phuket Lifeguard Chief Prathaiyut Chuayuan told The Phuket News today (Jan 12). “The man was unconscious when lifeguards brought him onto the beach,” Mr Prathaiyut said. “Rescue workers administered CPR before transporting him to Patong Hospital. However, he was pronounced dead at 1pm. Doctors confirmed the cause of death as drowning,” he added. Mr Xui’s girlfriend told lifeguards that he was not a good swimmer and that she had told him he should not go swimming as the red flags were flying but he ignored her advice. The Chinese Embassy has been notified of Mr Xui’s death. China now busy with her monetary problems. Phuket is just a dot on the world map. The number of coffins going to China are family wise tragedies, country wise not important. Sounds hard, but that is reality. And the Phuket desk authorities know that. Wasn't the Chinese government going to ban travel to Phuket at one point not too long ago? It's like  2-3 a week now dying from completely avoidable dangers. Where I'm from, that's an epidemic. I do agree with many other comments here till a certain level. Very true that tourists in first place have to look after their own safety at Phuket beaches. However, it is well known that many foreign tourists come from 'inland areas', they have never seen beaches/open sea before. Never heard of rip currents. Too many tourists, many of them just think fun and forget the danger side of swimming/snorkeling in open water, don't blame everything on phuket lifeguards and authorities. I understand your comment, BenPendejo. But something has to change at Phuket beaches. Guess the today PN article regarding,  (International World lifeguard Chief) gives a good impression of what is needed. Two Chinese tourists did die in Karon within 24 hours, 1 at beach, one on motorbike, with a 3rd one seriously injured in hospital. Is it not about time for the thai authorities to consider to give the thai beach guards more legal power in forbidding tourist to ignore red flags? Phuket Poll: How to best prevent more Phuket beach drownings?